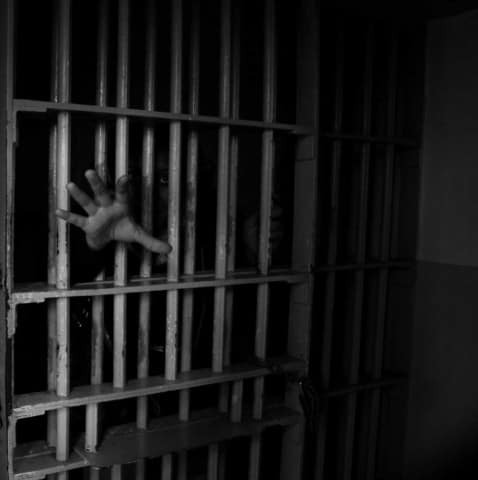 The United States is home to five percent of the world population, but twenty- five percent of the world’s prisoners. We keep more people behind bars than the top thirty-five European countries combined. In fact, the term “Mass Incarceration” refers to America, as the world’s leading nation, currently locks up 2.3 million people in federal and state correctional facilities. However, this academic sounding term “mass incarceration” doesn’t capture the insanity of the situation, including its rapid growth and racial disparities. For this reason, we build more prisons than colleges, we spend more money on cages than education, and even more money to keep people locked up who aren’t a violent threat to society. Over the past four decades, the War on Drugs has caused a significant rise in the number of colored people incarcerated. Meanwhile the War on Drugs forces police officers to focus on non-violent offenders, rather than violent criminals. Approximately 60% of American prisoners are nonviolent according to the NAACP, the National Association for the Advancement of Colored People. To put it in another way, the number of arrests in the U.S for drug violations in 2015 was up to 2.1 millions people. People use illegal drugs for self-medicating. For example, heroin was historically used to treat respiratory illness, Coca-cola used cocaine in its soda, and doctors regularly recommended morphine as a pain reliever. In addition, problems like mental illness, and homelessness are more appropriately addressed outside of the criminal justice system altogether. For this reason, it’s time we got serious about pulling our money out of incarceration and putting it into systems that foster healthy communities. Undoubtedly, Americans children and teenagers need to have programs that can keep them from making a careless mistake that can put them into the same vicious cycle as homeless and mentally ill individuals are facing. Also not only making sure that we support job orientation, college degrees and drugs counseling programs in prisons, but how do we confirm those same kind of institutional support contributes to children and teenagers before they get into criminal justice system and the ways for us to redirect young people who made mistakes early on in life so that they don’t get into the system again. 5 million children, or roughly 7 percent of all children living in the United States, have a parent who is currently incarcerated. Outside of just income, a parent can have a tremendous influence on a child. No amount of activities can replace a parental presence. We also need to focus less on punishment and more on future whether for those inmates or for the children that will one day inherit this country and make it their own. President Donald Trump’s plan would remove $2.4 billion in grants for teacher training, another billion for summer and afterschool programs, especially first generation’s aid programs and low-income students. And $880 billions spending cut in medicaid and medicare. We want to make sure that Medicaid is provided for working families. We don’t want the poor to sleep under bridges, to beg on the streets, to steal bread from the markets, because they can’t get any insurance. Instead of improving teacher quality state grants, Trumps decided to cut off the funding. Trump is attempting to make incarceration rates dropdown by cutting off $1 billion in mass incarceration, but cutting billions dollars from the need of 24 millions plus people and having all the money in military is not the way to do it. All this money that we have to spend to keep individual locked up in prison or wasted in wars, the government can use it to prevent people from committing a crime by giving them shelters, food, education, jobs and healthcare. In fact, The United States spent $80 billions to keep people locked up. And by the way, taxpayers, us, are picking up the tab of that price, without making us any safer. Now, just to put that in perspective, for $80 billion, we can use to invest in our nation’s future by providing free higher education. For $80 billion, we could double the salary of every high school teacher in America. For $80 billion, we could finance new roads and new bridges and new airports, job training programs, researches and developments. This is not an argument for the release of all criminals. Even if we hope that they are capable of redemption, murderers, rapists, predators, and kidnappers, should stay behind bars and away from communities to keep us safer. But it shouldn’t cost 80 billion to keep all nonviolent convicts locked up at the expense of everybody else. We are wasting billion of dollars on an unjust criminal justice system, when it’s not effective from stopping crimes. 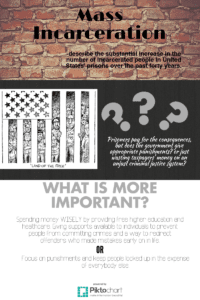 Ending Mass Incarceration by San is licensed under a Creative Commons Attribution-ShareAlike 4.0 International License. I’m glad you mentioned the war on drugs. In America, it is indeed a massive problem: the people using those drugs tend to just be a waste of space in prison, and don’t belong in there. They should either get help, or perish if they refuse to get treatment. As such, our incarceration rates are ridiculously high, and should be lowered. I also believe that we should rehabilitate people instead of putting them in for extensive terms. Punishment is good, but rehabilitation should be a part of the process.